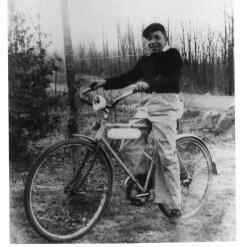 This is my fathers first new bike about 1948. Any Idea on the make and model, please let me know. Looking closely at the photo, I see that the frame has rear-facing dropouts which indicate that this bike is very likely a pre-war design, but I also see that many of the components that would normally be chromed appear to be painted black. Namely, the sprocket, bottom bracket cups/races, the hubs, and the handlebars. During World War 2, restrictions on the use of some metals for manufacturing meant that chrome plating was a luxury, and in it’s place many parts were simply painted instead. This tells me that the bike was probably made between 1942 and 1945. Other details, such as the sprocket design which is barely visible, looks like a possible match to one used on Shelby built bicycles. Also, the head badge shape matches a common shape used by Shelby. The chain-guard is also similar to a Shelby design. Is the bike a Shelby? Maybe, but the photo is fuzzy enough that I can’t say for certain.